If You're thinking about starting your own consulting business, tThis book will help you start earning money in your own QuickBooks Consulting Business. It includes results of a national survey of QuickBooks ProAdvisors about their annual income, and over 300 comments and advice that reveals their KEYS to SUCCESS! This book will help you start earning money in your OWN business with the wealth of information it provides. It includes steps to start your own business (and estimated start up costs); how to define your services and set billing rates (includes average billing rates); how to improve your knowledge and experience; obtain new clients and effective marketing ideas; details about websites, client engagements, market opportunities, growing the business, and MUCH more. The book includes results of a national survey of QuickBooks ProAdvisors about their annual income, use of engagement letters, over 300 comments and advice on things they wish they had known sooner or done differently, their KEYS to SUCCESS and more! Bookkeepers, accountants, tax preparers, and consultants will all find beneficial information in the book. With your own business, you can decide what hours you want to work, services to provide, and work from home if you choose! This book will help you SUCCEED! Reader Jeff Lippincott of Jlippin.com says, "Great book! I liked it a lot. I think it is a wonderful book that will help someone with an accounting background either take the plunge into self-employment as a QuickBooks consultant, or give someone who already has their own bookkeeping or accounting firm the know-how to expand into another service offering. This book is not about Quickbooks per se. 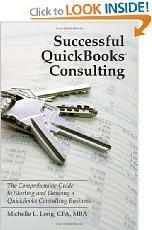 It is about how to become a Quickbooks consultant in a professonal capacity. "The author has ties to Intuit and the Kauffman Foundation. And sometimes the book comes across as an advertisement for these two organizations. She is also a QuickBooks consultant herself, so this book comes across as a marketing piece for her private practice, too. But the book is a short quick read that certainly opened my eyes to what a person can do to prepare for and become a self-employed QuickBooks consultant. "I am a SCORE volunteer who regularly counsels wanta-be entrepreneurs and small business owners on how to prepare business plans and how to get their new businesses up and running. I'm also a CPA and attorney. I am not one to advise my SCORE clients to spend much on consultants to help them start their own businesses. And the way I usually advise my clients regarding bookkeeping and accounting is to get a PC and a copy of QuickBooks Pro. "I tell them to install the software on their computer and struggle with the program for a week. Try to set up their accounting system and then save the data file to a CD. Then find a QuickBooks consultant to examine it and tweek it so it will work well for the business and the data can be easily merged into Turbo Tax at year end. Now that I have read this book I know a little more about what credentials a QuickBooks consultant should have and how my clients can easily find them.